According to encyclopaedia Britannica Andalucía covers an area of 33,819 square miles, so although this is our third visit to this region in our motorhome, there is still plenty of it that we have yet to explore. Notorious for is White Villages or Pueblo Blanco as they are known here, we thought we’d take the time to explore a few that we haven’t already seen. Our first stop was at Carmona, one of the oldest towns in mainland Europe and only a short drive from the regions capital of Seville. You will probably arrive at Carmona by the large defensive gate and Moorish fortress known as the Alcazar de la Puerta de Seville. The fortress is Moorish and the gate Roman and major alterations were carried out in the 14th and 15th centuries. Tickets to enter the Alcazar can be bought at the Tourist Office at the entrance to the fortress for just €2 each. There is not a huge amount to see inside but from the Tower of Gold you get some fantastic views over the town and so it’s definitely worth a visit. A walk around the San Felipe quarter reveals several churches and attractive narrow streets and also leads to the Alcazar del Rey Don Pedro. This fortress is largely in ruins but one of its wings has been renovated and converted into the Parador of Carmona. We love how the Spanish take care of some of their old buildings and convert them to hotels so that they are still being used, I’d love to stay in one – another time maybe. The parking spot we found at Carmona (see below for details) was on a steep hill, so not suitable for an overnight stay, but perfectly fine to park for the day. Next on our list was the town of Arcos de la Frontera and it’s everything you dream a pueblo blanco would be. It’s considered to be the gateway to the white villages and stands majestically on a clifftop. An amble around the narrow streets will lead you to the main sights, which as well as the churches and castle there’s also another impressive parador located in the Plaza Del Cablido. The square is also bordered by the town hall and an impressive mirador. We parked out of town by the nearby lake overnight (see below) and drove to the outskirts of the town where there is also opportunity to park for our visit the next day. Note though that even from here it’s a steep climb to the top for the best views. With a free aire situated just outside the town, Casares was our next destination. To say that Casares is pretty is an understatement, a picture postcard village which clambers up a rocky outcrop just nine miles inland from the hustle and bustle of the Costa del Sol. All around the beautiful scenery of the rugged Bermeja mountains provide a wonderful backdrop to this spectacular white village. The crags around Casares are home to a colony of Griffon vultures. These majestic birds, with a wing span of two metres, glide on the thermals high above countryside of deep gorges and pine forested ridges. The viewpoint next to our parking place offered the perfect spot to watch them in flight. Because of its stunning setting, Casares is known as the “hanging village”. It’s an enchanting little place, with sun-bleached white houses cascading down the hillside beneath the remains of the Moorish castle which sits at the very top of the ridge. When you visit though, be prepared for a steep climb through the intricate network of narrow, winding streets which lead ever upwards, through the town, culminating at the remains of the 12th Century castle at the very top. There are literally dozens of similar pretty white villages in this region, so make sure you take in some of them on your travels. Take note that a lot of these villages are unsuitable for cars let alone motorhomes, so always aim for out of town parking. 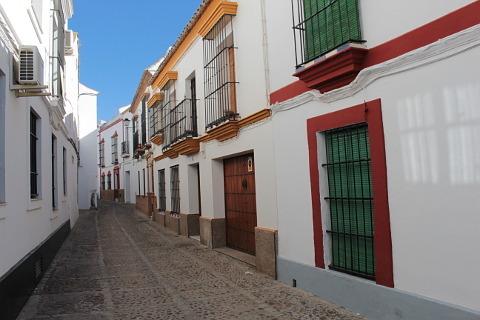 Arcos De La Frontera – there is a parking with no services at the bottom of the town (there is a water fountain by the restaurant). You can stay overnight here although we didn’t GPS 36.748806 –5.816446. We overnighted by the lake at the end of a dead end road, it was a lovely peaceful spot although there was only room here for one motorhome GPS 36.758379 –5.789387. Carmona – we just used this to park for the day and don’t think its too suitable for overnight as it’s on a slope GPS 37.470501 –5.64123. Come and explore this beautiful region if you get chance. That was a luverly read, especially after suffering Newsnight. Thx very much. Well written Andi – a lovely report on Andalusia, makes me want to go there but we are committed to Germany / Austria and Hungary this year. Can I ask about your stops – do you chose them well ahead or do you look on the day you need them? I know there are many ways of finding an Aire – which is your preferred route – book – website – app? Keep up the good writing and best wishes from cold Cardiff. We don’t really plan ahead as we like our plans to be fluid so we just tend to decide the day before where we are going next. We have now got rid of all our books and just use apps. We have lots of motorhome parkings that we’ve uploaded to maps.me so we use that along with park4night and search for sites. We do have the ACSI book but haven’t yet used it on this trip. Enjoy your trip.